The days are getting warmer and longer once again. We’ve crawled out from under the snow of this year. Dare I say that winter is truly past us? As most people are excited to celebrate mother nature’s rewarding vibrant presence of spring, I, on the other hand, anxiously await the opportunity to discover whether my honey bees survived the unforgiving New England winter. 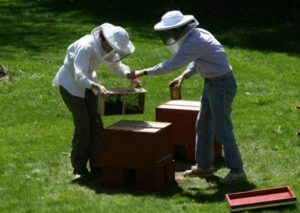 The arrival of spring is bittersweet for us bee-keepers out there, for we can feel helpless to the unpredictable winters where our hives can no longer rely on our support to thrive and remain strong. On the other hand, opening the top of the hive to hear that steady hum obtained from thousands of female worker bees flapping their wings to keep the hive a consistent temperature is both a sense of relief and excitement. 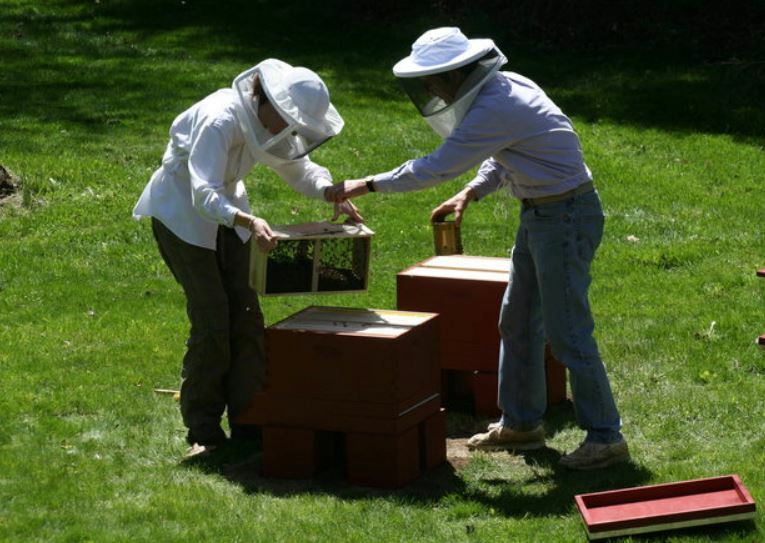 I became interested in beekeeping about ten years ago with my father when we decided to take a class on beekeeping. I have always had an interest in gardening and animals but had never thought of being able to create a symbiotic relationship with an insect before. All bees can be a great symbol of nature’s health. However, we have seen a decline in the bee population over the last few decades. If bees are not doing well, it is evident that the ecosystem is also not providing an ideal support system. This can be attributed to the heavy amount of pesticides being used on crops that have wiped out many bees. Another cause is the need for human expanse, which is replacing natural habitats with urban ones which provide minimal resources to bees. Changes in climate such as the warmer winters has affected flowering times within plants, which the bees rely on for food and consequently affect their pollen and honey harvest cycle. Our first year of having honey bees at my parents’ house was fascinating. I was able to bear witness to the ongoing work these tiny creatures are capable of. The hive itself is a work of art – so many combs filled with oozy golden honey perfectly sealed with beeswax. Their form of communication is done in a graceful dance, each story leading to a different pollinating spot. After seeing the unstoppable efforts these small insects were producing it became wildly evident to me that bees are so heavily overlooked for their contribution to the environment and that I decided I would try to do my part to help them. So here I am, a sole beekeeper who found herself drawn to the unique relationship established with bees over the last decade, passionate about sharing information about these amazing insects. If you are a take-action kind of person, then there are a few things you can do to help keep the bee population thriving. I encourage you to buy local honey. This raw honey contains local pollen which can help strengthen the immune system against allergies. I also recommend to stay away from using any sort of harsh chemical pesticides to kill weeds, as these products are very harmful to bees. Planting native flowers to New England is a small contribution that is also great for our environment and the bees. Lastly, leaving small bowls of water out is especially helpful to bees in more urban set areas where natural water is more difficult to come by in cities. Don’t forget to do your part to keep mother nature in balance! And please share this information with others!